The over 1,000 photos come in several albums. These are more or less in the correct time order, but with so many people making photos and only once in a while downloading them into the Media Box, the chronological order got screwed up a bit. ↑ The group-wide general introduction to Worldflight 2010. This video shows a mix of several of the participating simulators, using footage from several years. ↑ Video blog one shows the start in Sydney and footage of the first few long legs over the Pacific and North-America. ↑ In video blog two, we mainly show how incredibly boring many legs actually are. The action is at the departure and arrival, but in between, especially the ocean flights are just plain brain-dead unless you keep yourself busy in between the weather checks and position reports. ↑ Video blog three tracks us into Africa. We started receiving TV crews on the flight deck. To get some more action, we introduced some aircraft malfunctions to a bored crew and saw how they neatly worked themselves out of it al. ↑ From Africa via the Middle-East to Europe. Featuring David Twittenborough presenting his special documentary "Life on the Flight Deck," the UK World Flight Support vehicle, and an unknown flight engineer. ↑ Our resident real-life 747-400 captain Jon Bunting earmarked this video as "nearly impossible to spot that this is a simulator." ↑ Captain Hoppie and First Officer John take the Queen into Mumbai (part I). ↑ Captain Hoppie and First Officer John take the Queen into Mumbai (part II). ↑ The crew of Speedbird 744 shows the world how good they are at flying on instuments. ↑ While in Egyptian airspace, a TV crew from the Brazilian TV Globo programme Fantástico took a lot of footage to produce a nice 4.5-minute feature about Worldflight in general and the UK team in particular. During the 2009 event, we produced no less than six full-blown videos, including a general teaser promo and five video blogs. Day One Report Steve produced our first daily report video on YouTube. Day Two Report Not just day two, but our second video is available. As time goes by, media exposure grows. I collect several noteworthy links to media events over here, without claiming to be exhaustive. And also the many private videos now being produced from WF footage. SimFest Team going into Anchorage. Sounds like each pilot thought the other was actually flying the airplane. The official #1 podcast (more to come as they are being edited). By Steve. BAW744 hits an offset problem after a botched takeoff and gets warped several miles from the airfield. They desperately try to return by using their 18x4 all-terrain capabilities. By Steve. A link to all local BAW744 photos on John Davis' web site. By the SimFest team from Britain. A nice compilation of the final leg Sydney-Melbourne from their 777 flight deck. 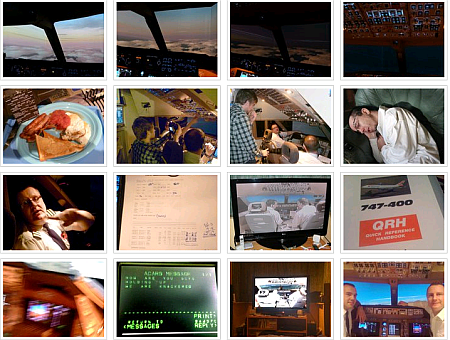 A collection of tower view and radar view time lapse sequences, showing many legs of World Flight 2007 arriving and departing. By VATPAC. An assembly of mostly MS-FS scenery shots. By John Davis. They popped by John's house with a satellite van for the 6 o'clock news. Traffic jam time radio show featuring the madman.